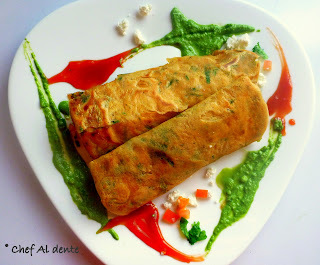 I came across the recipe for Paneer Chilla on the blog Preeti's Kitchen Life, while browsing through the food photo gallery on Knapkins - a very fun way of discovering new dishes by the way! A quick Google search told me that this is a popular breakfast snack. 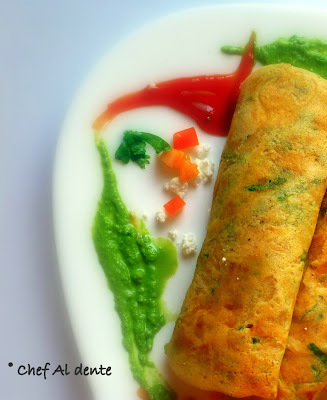 Chilla refers to the simple pancake made with gram flour (i.e.besan) batter with chilli and onions and then it is stuffed with cottage cheese or paneer. It is relatively simple to make and makes for a quick healthy breakfast. Just what I was looking for! "A 100 g serving of chickpea flour provides 387 calories, 22 g of protein, 6.7 g of fat, .7 g of saturated fat, 58 g of carbohydrates, 10.8 g of dietary fiber and 64 mg of sodium, according to the website Nutrition Value. 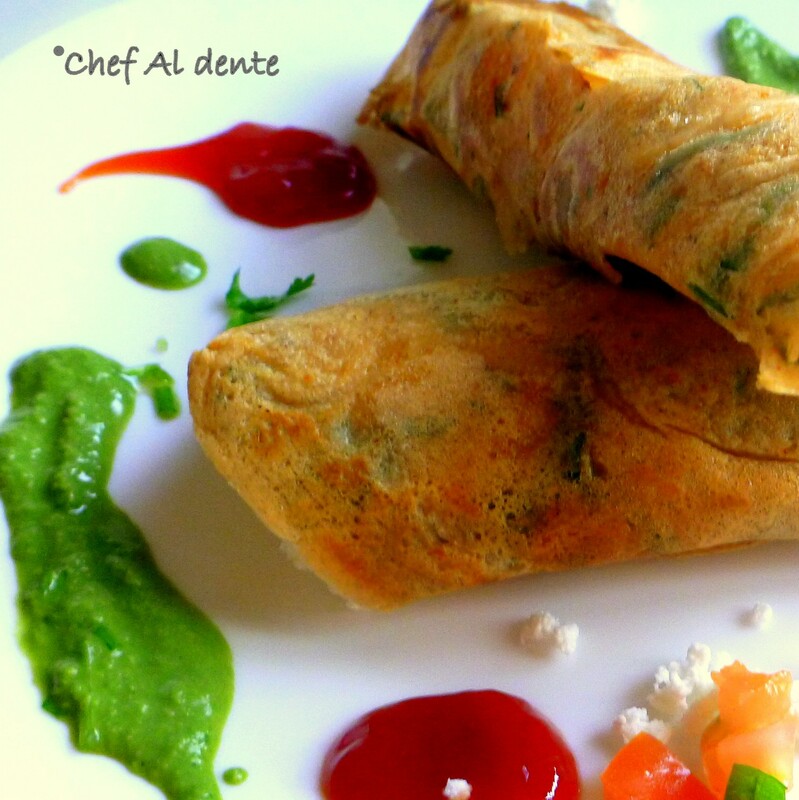 Chickpea flour is loaded with vitamins and minerals. It is particularly high in folate or vitamin B9, thiamin or vitamin B1, vitamin B6, magnesium, potassium, phosphorus, iron, copper and manganese." First prepare the batter: mix all the dry ingredients - flour, spices and salt with a quick whisk. Add the oil and then gradually pour some water to make it a thick paste. Whisk well to remove any lumps. Then pour enough water to make a batter, not too thick nor too thin. Add the chopped coriander and give it a quick mix. Do a taste test to adjust the flavours. Set aside. Heat a non stick tava and grease the surface with some ghee or oil. Pour a ladle of the prepared batter to the centre and then spread it in swift circular motions using the back of the ladle, to form a thin pancake. When bubbles appear on top surface, flip it and then cook the other side. Cook both the sides well till it is crisp and golden brown. You can drizzle a bit of oil on top while cooking so that it becomes crisp. Once the pancake is done, place it on the serving plate, add a tablespoon of paneer along the length at the centre. Followed by some chopped onion and tomato on top. Season with salt and pepper. Then fold the two opposite edges towards the centre to form a wrap. Serve hot with tomato ketchup and green chutney (number of servings will depend on the size of your pancake. I made 4 four medium size pancakes using the above measurements). Healthy Delights hosted by Spicy Treats; Midweek Fiesta#15 by Food Corner. this is a very yummy & taste great with bread filling too! Paneer ka chilla looks very appealing and perfectly done !! lipsmacking filling too !! Thanx Vimitha :-) Do try it sometime...very easy! This is a very easy and colorful dish. Looks yummy too. It has great nutritional value also.I will make it. Happy to follow your space..
Do drop by my space & I would love if you follow my space too.. This looks wonderful! I was in India a few months ago and my husband feel in *LOVE* with paneer. I'd really like to make it for him so I'll give your recipe a try. :) Thanks! 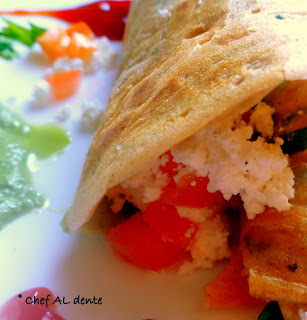 Droolworthy Paneer Chilla and the Clicks 2.